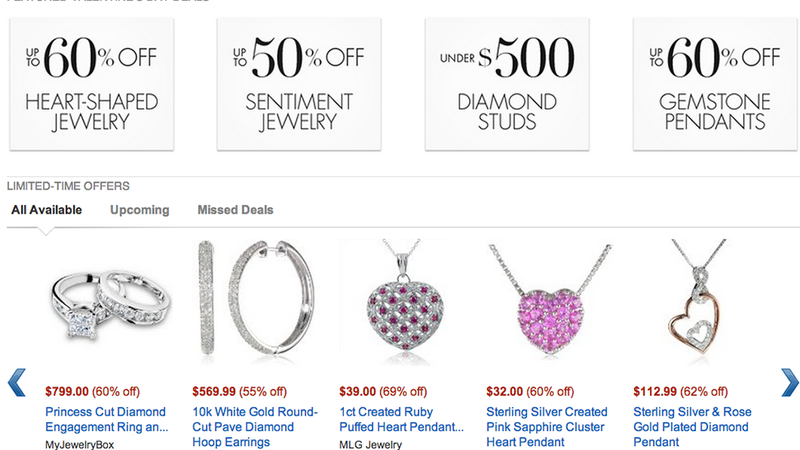 Because Valentine's Day is this weekend, Amazon is heavily promoting jewelry bargains. Makes sense! But are these discounts really a deal? Not exactly. If you can get through all the cheesy heart-shaped stones and necklaces with angel wings, there's actually a decent selection of jewelry on Amazon. We asked Gemological Institute of America-educated Kristen Dowling, who's a cataloguer at Philips Auction House in New York City, about a few items we thought you might consider surprising your girlfriend with this Valentine's Day. And, more specifically, whether they're be as much of a steal as advertised. "That means there is only 41.6% gold in the metal, as opposed to 58.5% in 14K or 75% in 18K." Just under a whole carat is pretty good right? "But notice there are 25 diamonds! As you can imagine, small diamonds are much more common than large ones. If there was only 1 diamond weighing 0.99 carats then the price would be much higher. Also, the 0.99 carats is between two rings. Each ring only has about half a carat but they don't specify that. They only advertise TOTAL weight." That means that there is very little yellow in these diamonds. These stones actually have great color but I1-I2 clarity means that this stone is highly included. Highly included? That sounds like a bad thing. Yup. Inclusions are natural minerals and imperfections within the diamond. Flawless diamonds are, of course, very rare. So the less included the stone is, the better! So is it a good buy? In this case you're getting what you're paying for, which is to say, a low quality ring. Dowling said "This ring set is priced the way it is based on small, average to poor grade stones and low gold content metal." Pass! What about these sterling silver/14K yellow gold garnet earrings? Sterling silver is very inexpensive and with such a small amount of 14K gold, the metal value is still very low. Garnets are a very low cost gemstone and I am sure that the earrings shipped to the buyers will be much darker that the beautiful bright ones shown in the image. You see, no two gemstones are exactly the same, so jewelry manufacturers can get away with slight variations like this. So once again, the "sale" price isn't really a bargain, it's just the going rate. To make matters worse, you have no way of telling whether you're getting your money's worth until you see them in real life. Again, these probably aren't your best bet. Black diamond and white topaz halo earrings? Those sound fancy. I am always impressed by the marketing techniques in the jewelry industry. Just like "Cognac Diamonds" and "Champagne Diamonds" (which are low quality brown diamonds that no one bought before these genius marketing techniques) Black Diamonds are very popular right now. The techniques vary, but essentially black diamonds are low low low quality diamonds that have been treated to turn a vivid black. White topaz is a very common, low-cost stone. It's a nice alternative to diamond but it doesn't have the fire and sparkle that diamonds do. I personally wouldn't pay these prices for these pieces but that's only because I understand what I'm getting on a technical level. All three of these pieces look nice and are priced relatively well for the market and I find that most people tend to shop online for style and budget first. Those looking for quality in jewelry will walk into a store. Emphasis mine. However, that's the most important takeaway from this exercise. If you're serious about buying quality jewelry at a good price, you should probably do your shopping in person. And in all cases, the "sale price" isn't really a sale at all. It's just what you should realistically pay. Maybe you don't want to listen to this advice. You're freaking out! Valentine's Day is this Friday and you have no choice other than to order something on Prime. If that's the route you're going to take here are a few things to keep in mind. 1) Seller credibility: Check out the name of the actual retailer. See if they have a site other than Amazon. That might give you a better idea. For example, the engagement ring set has no user reviews on Amazon, but when you go to the actual site for the retailer—MyJewelryBox—and search the same set, you can see what people have to say. Some of the reviews sound like bots, but the ones that sound legit are saying that the ring was smaller than expected. 2) Description details: As we mentioned before, pay attention to marketing speak. Words like "Tiffany" and "emerald color" can be misleading. For example, "Tiffany mounting" doesn't mean it's a ring from Tiffany & Co. Likewise, "emerald color" doesn't signify an actual emerald, but rather cheap, green-colored glass. Don't let words mislead you. 3) Quality: Fine jewelry is going to be sterling silver, gold, or platinum. "Gold-colored" does not a precious metal make. Once again, don't be fooled. 4) Seeing is believing: You judge diamonds with the four c's: cut, color, carat, and clarity. Those aren't things you'll be able to judge until you see them. Similarly with other stones you might cop on Amazon, you don't know what you're buying until you're holding it in your hand. 5) Shipping and return policies: It's probably a good idea to make sure you at the very least require a signature for an item you just paid several hundred dollars for over the internet. Similarly, you want to make sure you can return what you ordered if it turns out to be a piece of vending machine-caliber hot garbage. Sure, these carats of wisdom are important to keep in mind in whatever venue you're buying jewelry, online or in person. But you're almost always better off putting in the extra effort and buying your bling in a physical store where you can talk to real people and touch and feel and analyze the product. On principle, it's the thought that counts. But it's also the price that counts, and Amazon prices, despite deep discount claims, are nothing special.